This story travels 100 years into the future from last weeks watercolour and is about a book which connects not only this country but one down under. ‘The Brumby’ is the title of a book written by #MaryElwynPatchett. A brumby is a free-roaming feral horse found all across Australia. Originally published in 1958 by the Lutterworth Press, it is the Puffin edition from 1964 that is the topic this week. Puffin produced a very fine cover (pictured on the left) for their publication of #TheBrumby. I have found one site which attributes the artwork to #BarringtonLionelDriscoll. Usually called Barry Driscoll, he was a British painter, wildlife artist, and sculptor who started as a book illustrator. Mary Elwyn Patchett was born in Australia and grew up on a cattle station in Texas, Queensland. An independent child, her time was spent with her pets and the animals from the bush. It is this world which she drew on for her books. She moved to England in 1931 and worked for the BBC Children’s Hour. Her books were translated into many languages, and she was considered to be the most widely read Australian children’s author of her time. Her books are excellent reads and she does not back away from the harsh realities of the Australian bush. 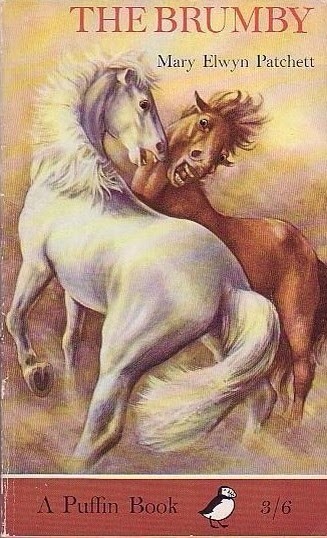 ‘The Brumby’ is the first book in her pony series. This is the watercolour which I bought earlier this week. It is, I believe, the original artwork for the cover of the Puffin edition. They only used half of the image as you can see. A detailed work of no little skill. The overall image is as impressive as the cropped version. It is signed in the lower right corner as well as dated but the signature does not appear to be that of Barry Driscoll. To me it looks more like ‘Leonard’. On the back there is a message which reads ‘Leonard Peters – typographic department – time – six weeks making approx. hours up to 100 hrs work’. Typography is the setting of text so Mr Peters is not likely the artist. Although there is one site which gives Barry Driscoll credit, I have not been able to confirm that anywhere else. Be that as it may, the work is finely executed and it is no wonder so many people are impressed with the cover of the book. Barry Driscoll specialized in animal subjects and established an international reputation as a wildlife artist and it may just be that he is the artist responsible for the cover. The internal illustrations were done by Juliet McLeod – a well respected and renowned equine artist. 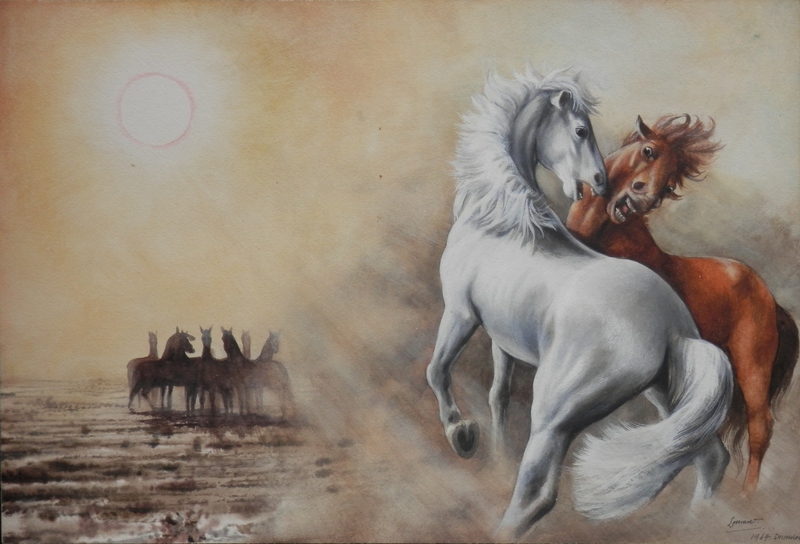 This entry was posted in Watercolour paintings and tagged Australia, brumby, horse, mane, outback. Bookmark the permalink.